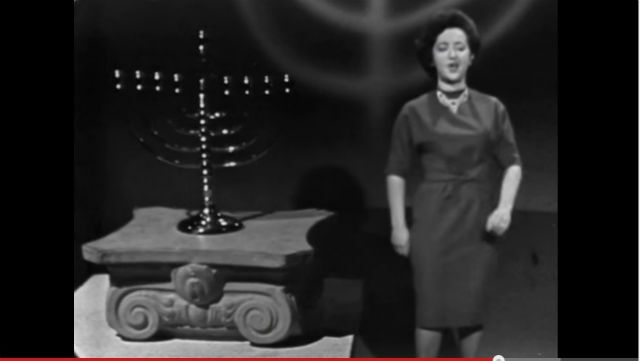 My cousin shared on FB this Youtube clip, which you can see here, of Esther Ghan, Canada’s first female cantor, singing traditional and Israeli melodies for the BBC in 1963. Esther Ghan was the stage name for Esther Firestone. On this clip, I like the old-style public performance of Judaism and the darkened, very simple stage setting. The Hannukah menorah sits on top of what must be an architectural mock-up of some ancient Israelite or antique Judean column, with long shadow-like figure of an archaic candelabrum cast on the backdrop behind the singer. The singing is feisty, sentimental, and melodramatic, accompanied by a single piano, and dominated by minor chords. The scene shows one way that Judaism was made to look and sound before the public eye and ear on a mainstream media platform 50+ years ago back in the 1960s. Politically, it shows how already in the early 1960s, Israel shaped North American Jewish culture. Given by a woman’s voice, the aesthetic is modern, folksy, and Zionist. The songs at the end of the clip, after the more familiar Ma’oz Tzur are particularly beautiful and haunting, especially the last one Ha’Galil. On a slightly personal note, I’ll add the following. Born in Winnepeg, Ghan-Firestone’s brother married my aunt Phyllis, and then they moved to Israel. Ghan-Firestone recently passed away in Toronto. With apologies to Canada, I’m going to “tag” this here at the blog under “American Judaism.” There’s a nice little obituary here. Love to the cousins. This entry was posted in uncategorized and tagged aesthetics, American Judaism, gender. Bookmark the permalink.